Are you using Facebook as Your Own TV Channel? 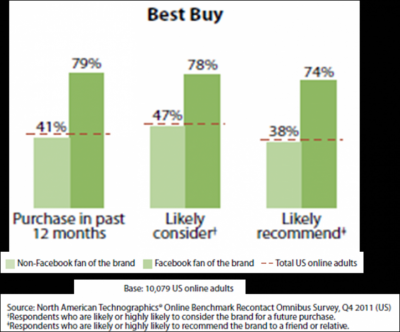 A new report from Forrester Research© addressed this question and very simply found out that for such brands as best Buy, Walmart, Coca Cola and Blackberry, being a Facebook fan boosts purchase, consideration and recommendation. Think of it this way, your Facebook page is your TV station. It is your chance to broadcast your message; to interact with your customer, to entertain them and engage them. NOT just to sell them. Think about contests, rewards, games and anything else you can do to continually build upon a relationship you have just started to develop. Be relevant, be needed and your sales will increase among your Facebook fans. But you have to stay at this. If not every day, then at least 3 to 4 times a week.